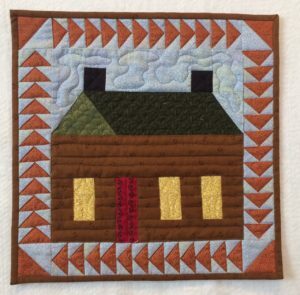 What fun we had yesterday at our first gathering to begin making Colorado Log Cabin Medallion quilts! I really enjoyed the ladies that were there and I hope those that are following along by email can catch the enthusiasm as well. We started with the first round which is the Log Cabin surrounded by Flying Geese. It can be made into a 12” finished quilt which looks quite nice hung on an Ackfeld table top hanger. Or it can also be the beginning of the medallion quilt. It was fun to see everyone picking out fabrics and choosing colors. Some are going to follow along with the pattern and others are branching out with colors more suited to their own taste and home décor. Either way I will be anxious to see what comes back next month in the way of completed tops. 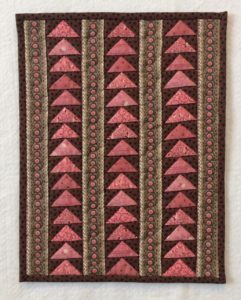 The other option was to make a little Mini Flying Geese Quilt which can be done in pink and brown or any colors of your choosing. We’ll see if anyone wants to adventure into the world of minis. If you might still be interested, it is not too late to sign up. For only $10 you get the first two patterns and then if you complete the top for one of them you will get next month’s patterns for free. 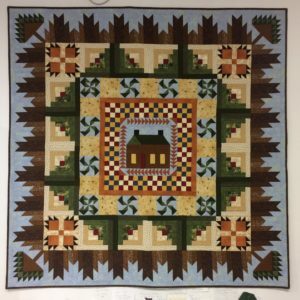 Next month we will add the 9-patch border to the Log Cabin or you can make a little quilt called Bits and Pieces as seen to the left. 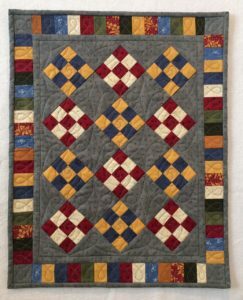 Just for You – Quilt Quote (and this is one of my favorites): “Cooking is for those who don’t know how to Quilt ”.